What Basecamp 2 Triggers and Actions are Supported? New Project Template - Triggers when a new project template is created. New Calendar Event on a Project - Triggers when a new event is added to a project. New People - Triggers when a new person is available in the account. New Topic - Triggers when a new topic is added (A new message is a topic, and the first comment on Calendar Events, Uploads, and Todos are topics). New Calendar - Triggers when a new calendar is added to Basecamp. New Todo Item - Triggers when a new todo is added to a todo list. New Activity - Triggers when something happens inside of Basecamp. This trigger will give you a brief overview of the event that happened. New Account - Triggers when a new account is available in Basecamp. New Calendar Event on a Calendar - Triggers when a new event is added to a calendar. New Todo List - Triggers when a new todo list is added. New File - Triggers when a new file is added to a project. New Text Document - Triggers when a new text document is added to a project. Global Activity - Triggers when anything across any project happens. Use a filter step with this! Create Calendar Event on Project - Creates a new calendar event on a specific project. Grant Access to Project - Give a user access to a project. Create Message - Creates a new message. Create Todo - Creates a new todo item. Create Calendar Event on Calendar - Creates a new calendar event on a specific calendar. Create Project from Template - Creates a project from your template of choice. Upload File - Copy an already-existing file from the trigger service. Create Project - Creates a project. Create Todo List - Creates a new todo list. Create New Document - Create a brand new version tracked document. The first thing you'll need to do after selecting a Trigger and Action is connect your Basecamp 2 account to Zapier. First, click to connect a brand new Basecamp 2 account to Zapier. Inside the Zap editor, this might be a large orange button. Basecamp 2 makes it super-simple to connect to Zapier. The only option here is to label your new connection, if you'd like. This label is only used inside of Zapier. You should now see a new window appear, asking for your permission such that Zapier can access your data inside Basecamp 2. Clicking the green "Allow" button finishes the process! Your Basecamp 2 account is now connected to Zapier. Basecamp 2 decided to remove the end date/time from their UI and ignore any submitted end date/time from the API and thus Zapier. Because of this, the end date/time field has been removed from Zapier. Basecamp 2 seems to consider all calendar events are point events -- setting the start date/time and end date/time to the same start date/time value. This usually indicates you're using the wrong version of Basecamp 2 on Zapier. We support two versions. Make sure you're using the right version by reading this. These are somewhat common for Basecamp 2. 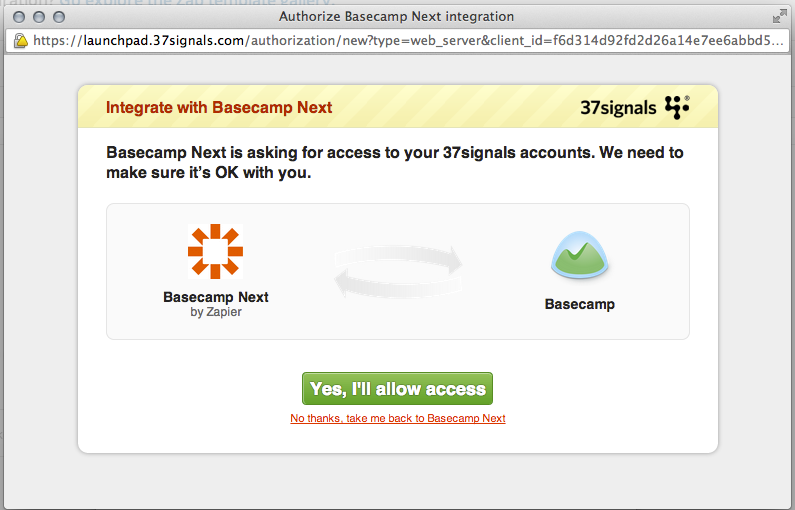 It might happen because you have a lot of data in your account or because Basecamp 2 is having temporary problems. You can check if there are any outages on our API Status Board, but sometimes ephemeral connection timeouts won't be shown. The best solution here is to try and wait it out. If it's still happening consistently up to 24 hours, contact us and let us know. This means your connection to Basecamp 2 has expired. It might be because you changed your password, Basecamp 2 reset their API keys, or something else. To fix this, go to your connected accounts in your settings and re-connect Basecamp 2. This indicates you're using the wrong version of Basecamp on Zapier. We support two versions. Make sure you're using the right version by reading this. Right now, we don't support template selection when creating a Zap, so there won't be a way to use/select one.